I just heard about the Easybreath Snorkeling Mask. A company called Tribord, in England, invented this new kind of snorkel mask. I was wondering if you knew anything about it. Thanks. Hi Manuel, this is the first time we have seen this Easybreath Snorkeling Mask. It looks interesting. It would definitely put less stress on the mouth. But it seems a bit big. And it looks like it might be difficult to fit on different people's faces. This mask doesn't look like it has actually been released yet, and may only be available in Europe. We are interested to see if anyone else knows anything about it. UPDATE - Dec. 30, 2014: These masks are now available on Amazon. Also see ad at right. UPDATE - July 25, 2016: There are now many more brands of full face snorkel masks available. We tried one and wrote a review page complete with brand recommendations and a full list of pros and cons. UPDATE - February 23, 2018: Tribord changed its company and brand name to Subea in 2017, so the two names are interchangeable. Probably fogs up. I would not use it. They have recently come out with these for scuba. I was wondering if there was anything comparable for snorkeling. I am hopeful that we might find one to try for my Gary. He has a very hard time with mask fit. His problem is that in a very short amount of time in the water, his mask suctions down very hard against his face to the point of being very painful. Despite exhaling into his mask through his nose, a moment later it is severely suctioned onto his face once again. I am thinking that a full face mask might be just the answer to his problem. Would give it a try if I could rent first. Would be nice not to get the waterlogged prune lips after a long snorkel. At 550g (about 1.2 lbs), it would take up 2.55% of most peoples luggage allowance. That's a lot! For years my husband has watched me snorkel but been unable to join me... Due to a bilateral cleft palate he is unable to get a seal on any of the mouthpieces we've ever tried. It has been disappointing and demoralizing for him BUT this mask could be a game changer for him! If anyone has tried it, please let me know how it went for you. We'll be going back to Belize soon and I would love to give this one a shot if it's really worth getting his hopes up again. Thanks! I have not tried this mask, but I got this information from the Decathlon sport store that sells it. The Easybreath mask is currently available in France at the Decathlon sport stores for 40 Euros. However, it is noted on that website that the it can only be used to swim at the surface, you can't free-dive with that mask. The volume is large and causes a lot of suction on the face. They say that even just 3 feet underwater the mask gets very uncomfortable. Also, you can't equalize with this mask as you can't touch your nose. I have been wanting to try this mask since I first learned about it in the fall of 2013. It finally came out in June 2014 in Europe only. Even though the retail price was supposed to be around 39 Euros they were being sold on Ebay (in the US) and people were paying up to $400 for one!! I watched them come down in price until I could pick up one for $100 including shipping in late September. By then it was too cold here in Wisconsin to try them outside so we went to a indoor pool to test them out. I have tried every mask I can get my hands on with and without purge valves since my mustache gives me leakage problems. I can use them but hate having to clear them all the time. Lately I use swim goggle type masks with nose plugs if I want a mask that I don't have to fuss with. I really wanted the Easybreath to be the answer but had my doubts. I thought, how can a full face mask possibly fit very many people. Well we were shocked. This is a dream come true mask. After using it for 30 minutes and not having any problems I tried to make it NOT work. I loosened the straps as much as possible but that didn't seem to be problem. When you inhale you create internal suction which helps it seal. The biggest surprise was learning that it doesn't matter if it leaks. If any water gets in it just goes to the bottom and goes out the purge valve when you exhale which creates positive internal pressure. I didn't even notice that it was self-purging, unlike a purge mask that you have to blow out of your nose to purge which can also fog your mask. There is a ball in the snorkel tube when you want to dive down or if a wave goes over you. It seals very fast and surprises you until you learn how quick it is. So is there anything bad about it...? Well at first it feels like your breathing is being slightly restricted but once you calm down and stop thinking about it, it works fine. Not sure if you were really kicking and huffing and puffing if that could be a problem. When I snorkel I don't do that and I still feel restricted at first with a regular snorkel tube anyway. When you exhale your breath is channeled around the outside of the mask so you really can't fog it up. You can breathe either with your mouth or nose. That is so cool. You can even talk if you want unlike with a snorkel tube stuffed in you mouth, not that anyone is going to hear you very well but it's fun to say WOW now and then. There is a bend in the face mask on the sides that causes some field of view shift but lots of masks have that. I think the straps are more comfortable than any mask I've ever had on and I felt some pressure points on my cheeks after long wear but that was less irritating than normal masks on my upper lip. Not having to hold a mouthpiece is the sweetest thing. My girlfriend agrees that this is a game changing mask. Especially for those people who hate or can't use a mouthpiece. Tribord says they are going to sell them in the USA in 2015. I wanted one for Palau and am looking forward to using it. I'll be bringing my normal swim goggle mask and nose plugs but hope I never need them again. This is terrific news! So glad to hear from someone who has tried it first hand. We are going to go ahead and get some next year when they hit the market here. Thanks so much for sharing your experience with this mask. How to clean your Tribord mask? The directions say not to use detergent or solvent to clean the Easybreath mask but they also say for the anti-fog system to work properly you should regularly wash the inside of the mask's window by hand with some "washing-up liquid". What, exactly, is "washing-up liquid" if not detergent or solvent? Can anyone tell me what they have done? Thanks. Maybe get a bottle of wetsuit shampoo and use that. It would certainly help care for the silicone skirt as well and is a gentle cleaner. We use the McNett brand. You would probably only need a couple of drops. Go to the Decathlon website, there's a video of a guy snorkeling and washing it at home. He uses green dish detergent and gives it a scrub and a 10 minute bath. That's it. I'm going to head to the UK to buy a few sets for the family. I purchased a pair of Easybreath masks. I thought this design might be a bit easier to use for my spouse, who has braces. I took it for a test at my local swim center. (Looking forward to a full test on the Big Island!) What is striking is when you get out of the water and realize your mouth and nose are still dry. You do not get out with the taste of salt (or chlorine) in your mouth. I was happy with how it performed. I had a leak at first, but the water ran down the front and was vented through the bottom. After an adjustment, it sealed quite well. Breathing was effortless. You can breath through your mouth or nose. As the manufacturer warns, it is not for free-diving. At a few feet the pressure against your face is somewhat uncomfortable. You can dive and the snorkel mechanism works fine, it just presses against your face at depth. Visibility was good. The front is mostly flat and then angles off to the sides. A similar mask that I use at work (airline respirator) has a rounded front and provides more of an unobstructed view. I believe the Easybreath mask has a little better view than a standard snorkeling mask. Again, I look forward to a week (or two?) of rigorous testing in Hawaii. I just used the Easybreath mask in Bonaire on the Woodwind Snorkel trip. I'm an experienced snorkeler and was testing it for the Woodwind folks. I loved it, so comfortable and good visibility! Great for beginners. I switched back so I could free dive and I like the taste of salt water and being able to surface and talk about what I'm seeing. I wrote Decathlon and they don't ship to the US. My son still has friends in Europe from when he was stationed there so he's looking into getting his friend to get one and ship it to me. That's what we want for our birthdays (in Feb.). Sounds like a good mask. A lot better at $50 than $250.00. Has anyone with a small face tried this mask? I have a Mares mask that fits pretty well (it took awhile to find one small enough..) but I also struggle with snorkels that are too big in my mouth! I'm happy to pay the $200 this costs, but it's hard to find anything local so I can try it on. I only see it online. I live near Washington, DC and will be in Barbados in early March. My son's friends say that Decathalon is sold out and the mask is back ordered in England, Wales and a few other shops. In the meantime, I've been on Ebay and found them at various prices depending on... get this... what country you order from. France, Germany, Spain, UK, even Hong Kong. From Hong Kong they have changed the name from Triboard to Thenice. There's a few from New York and Florida. I ordered mine from Michigan for $150.00. I'll have to try it before I get one for my husband and hopefully by then they'll be back in distribution at Decathlon. The shipping from my friends in England is about $40.00. I don't know how interested anyone else is but I'll keep you informed. We go to Hawaii every year and although I love to snorkel, I'm very fearful that something will go wrong with my snorkel and sure enough it happens whether it's water seeping or it fogs up. I'm not a good swimmer so it makes it worse! I think this snorkel will be a life-changing experience for me when we're on vacation! Please let me know when it's in the US. I would love to get one! This mask is a game changer! Due to facial trauma sustained in the military, my husband can't get a seal on a regular snorkel or open his mouth wide enough for more than a child's snorkel, so he hasn't been able to snorkel with me when we travel, which is very disappointing and hard on him. I got this for him so he could actually go snorkeling when we go to Belize... instead of just hearing me talk about it and having to stay on the boat/beach. Well, it works! It seals over his beard, too, which is a plus. He can breathe normally without any effort or stress and has a full field of vision. After watching him enjoy it, I'm going to order another one for myself because it sure looks easier than my regular snorkel and mask. Is it perfect for super avid and experienced snorkelers who have definitive ideas about what constitutes good equipment? Probably not and they might even consider it kind of a fad. BUT, for people unable to use regular equipment for whatever reason, this mask is a total game changer and I can't recommend it enough. Carol, You asked if it fit a small face. Yes, I have a small face, though I haven't been underwater with it yet but have put it on for a while. Just make sure you order a small. Mine fits perfectly. Have fun in Barbados. I too, have a small face. Heck, I wear youth baseball caps. I used my husband's mask and it worked great when I tried it. The masks come in two sizes, S/M and L/XL. Definitely get a small if you're worried but the Tribord site has measurements for each of the two sizes if you want to be sure. Also, I recommend looking on eBay for a new one as well as Amazon. We got a brand new one shipped from a US seller for a much better price than the few other retailers we found had. The smalls seem to disappearing on eBay though so you may want to act more quickly than normal. Let everyone here know how it works out for you. It's been such a huge success for us that I'm hopeful others with similar situations as us (facial trauma) will give it a try too. The Easybreath mask was unbelievable!!! I could wear it most of the trip and my face never even got wet. If water got in the mask you just felt a little splash and it was gone through the purge valve. I got kicked with a fin underwater and it shifted and water got in but it didn't soak my face at all and I never had to take it off, just reposition it. I also let my husband try it and it worked real well for him too and he has a beard and mustache. You do get lots of questions from people who've never seen one but one guy came up and said "I am so jealous" and with me being impressed myself I looked up and said "you should be". :) He'd used one that his buddy had back home and was just as impressed as I was. We had a good laugh. It is well worth the investment. I have a small face and it fit fine. You just adjust the straps to hold it where you want it. I wanted to share with you how the Tribord Easybreath Mask performed. My wife and I love snorkeling and I love my mustache, and as some of you know nothing truly stops the leaks nor the fogging when wearing a regular mask with one. I came across the manufacturer's website while doing some research. I read all the articles, watched the video and then the hard part, figure out where to buy one. After purchasing both types, the Tribord and the Thenice (2 different manufacturers), I tried them both. The Tribord Easybreath was amazing. It took some time to get used to the idea that I could breathe through my nose or mouth. It was weird the first few times diving down and resurfacing and not having to blow my snorkel clear. With that said, I loved it. And after some fine tuning there was no water and no fog in it. The Thenice was almost as good. It's like a Chevy vs. a Cadillac. It performed just as well. The fit wasn't as nice as the Tribord, though I think on a smaller face it would do nice. The thing I liked about both masks was that once fitted they are nice and you don't drink the water. If you have a first timer and they are afraid of the water this stops that fear. If you have a special needs child this is a good option. I know how important comfort is while snorkeling and I would recommend this. My husband struggles with holding a snorkel mouthpiece in his mouth, so we purchased an Easybreath Snorkeling Mask for him on ebay. We both LOVE the mask. I actually use a snorkel and ended up using this mask more than my snorkel. The visibility range is great and the mask was everything and more than we were hoping for. We purchased a S/M because my husband has a small round face, and he felt it was too small for him, but it fit me great. We are now in the process of hunting a second mask down as he would like to have a L/XL. The size guide said S/M fits most women and L/XL fits most men. I agree completely with the sizing. I wish they sold the masks in the US. There were a number of people who approached us during our vacation wondering about the mask who seemed extremely interested in purchasing one as well. 1000% satisfied with this one! Yes, 1000%. I just returned from a 5 day snorkel trip in Curacao and snorkeled the whole time with the Easybreath mask. I loved it! It did not leak or fog up. I wear contact lenses and am always worried about my mask leaking and ruining my contacts. I did not have to worry about that with this mask. I also felt like I had better peripheral vision and could see a lot more. I have a small face and the small/medium worked perfect. I did have to adjust the straps to fit my face correctly. I know this mask may not be for everyone, but it really is worth a try, even if you get weird looks on the beach. I have one and it is the greatest thing in the world. No fog, open sight, and if any water gets in it has a valve at the chin and it just passes right out. It's made 4 trips to St Thomas with no issue. Now the bad: you can't free dive with it, but if that's no big deal, get one, you will not be disappointed. I received one of these as a gift. It is designed to stay on the surface so you can look at the little fishies. The product information says it is not to be used underwater or for free diving. That is a deal breaker for me. I accidentally dropped mine. It fell about four feet to the sidewalk. The plastic purge valve cover broke off. The polycarbonate may be shatterproof but that same drop left a bunch of deep scratches. In my opinion this mask is not suited to a serious snorkeler. My wife and I had the opportunity to try the masks last year in Aruba. They worked flawlessly. The design of the mask eliminates fogging and seal around the face is secure and comfortable. We especially enjoyed the wide view afforded by the full face lens. We have since purchased two masks for our upcoming trip in February 2016. Has anyone tried the newer design? I thought I read where you can free dive with the full face mask.... I am looking at the full face snorkel mask by azorro. Thanks! Hello Maryann, the Azorro mask looks like yet another copy of the Easybreath by Tribord. You cannot freedive with any of these full face masks as you have no way to equalize the pressure in the mask when you dive down and the pressure will be too great. Hope that helps. I purchased a couple of the Tribord Masks through ebay and tried one out in Maui. The good things, as have been mentioned by others, are that it does not fog, fits comfortably, and is good if you don't like having a snorkel in your mouth. I thought the mask provided great visibility, but on that same note the shape of the mask provides some distortion around the periphery. I became nauseated while wearing this mask and actually blew chunks in the water. So much for my Loco Moco breakfast. I am not sure exactly why I got nauseated. It may have been the distortion caused by the angles in the mask. Or perhaps it was an ineffective air exchange when breathing through this type of mask. Or maybe it was just a perfect storm of different factors. I did not use the mask the rest of the trip. I just used my old mask and snorkel and did not have another chunk blowing episode. I have done quite a bit of snorkeling and never become nauseated before, so I am pretty sure it had something to do with the mask. I did try the mask one other time at a lake for a few minutes and did not have any issues that time. After reading your review of the Tribord full face mask I'd like to add my thoughts. I purchased my mask this past May for a trip to Curacao. I read and researched all the reviews before I purchased it. It was the best decision I could have made - I love my mask! For the first time I actually enjoyed snorkeling! I even did my first night snorkel! I'm not a water person by any means because I have a fear of deep water. For some reason I could never get used to the mouthpiece - it made my mouth ache and I don't like the taste of saltwater. The small amount of water that got into my mask made me uncomfortable. I wear contacts and was always worried about washing one out. I just couldn't relax enough to enjoy myself! But I was determined to snorkel. So I bought a snorkel vest and the Tribord! I didn't have to worry about the saltwater, my mouth getting tired, or blowing out water from my mask. I never got a drop of water in my mouth or eyes! And the vest solved my water fear problem! After a couple days I didn't need to put any air in it! The mask helped me overcome all the distractions. Maybe one day when I get comfortable enough I'll go back to my other mask and snorkel so I can dive down and explore - but for a novice or someone who feels insecure - this changed my whole perception! I have this mask and have been very happy with it. I haven't found it to be too warm, but I am snorkeling Hawaiian waters. I do find that since I have severe asthma, using this mask makes it so much easier for me to breathe. My throat is not drying out as it does with a traditional mask and snorkel set. I was a novice snorkeler on the point of giving up because I could not find a mask which did not either fog or leak or both. I am not a particularly confident swimmer and getting saltwater in my eyes and not being able to see where I was going let alone the sea life made it all seem pointless. As we were going to the Maldives on holiday I was reading various posts on the TripAdvisor forum and that is when I learned about the Tribord Easybreath Mask. Thank heavens! What a difference it has made. I was never going to free dive anyway so it is perfect for me. It does not tangle in my hair like my regular mask did. I have a good view and it does not fog or leak. I don't find it too hot or heavy and I have worn it in the Indian Ocean. I wash it thoroughly every few days with washing up liquid (what you Americans call dish soap, I believe). I take a small amount in a little bottle with me on holiday. I pack it in a hard sided cabin bag rather than in my checked-in luggage making sure it is well protected. I am lucky that, living in the UK, these masks are available in a local sports store as well as online and are quite cheap at only about £30. Snorkeling is now a pleasure rather than something I dread. I look forward to using it on more exotic trips. Currently on holiday in Mallorca and having seen a few people at the beach with these masks my daughter and her friend were keen to give them a try. They had tried conventional masks/snorkels previously, but found the feeling of not being able to breathe through the nose very unsettling. Did a bit of research and found the Decathlon store on the island sold them so I went and picked up 2 sets for them and one for me (very handy that they had demo models so we could try on and get the correct sizes). Verdict - fantastic. Used at Cala St Vincente and all 3 of us had a fabulous time. Very comfortable once adjusted (very easy to do, even with my beard) good vision and the breathing is so natural. First of all I'm all for the idea of a full face snorkel mask since I'm not a very good swimmer and the idea of loosing the tube was not good. The thing is when I try it snorkeling in relaxed mode in the Greek seas and breathe normally, after a maximum of 10 min I start to get dizzy and later nauseous. I think the story is that the air does not circulate enough and you start breathing CO2 in high percentage. When I tried breathing more forcefully and could increase pressure inside the mask, I had a better result. Anybody with a similar story and different results? Hi Jason, I had the exact same experience in the Tribord Easybreath Mask. I felt like I could not get a fresh breath of air unless I breathed very forcefully. It is called rebreathing. We have a link to my full review in the first comment on this page. I bought Tribord full face snorkel masks for my 2 adult sons before a trip to Curacao. Neither had snorkeled before and both have exuberant facial hair, so I thought they would be a good choice. Neither one could use them, so both my husband and I gave it a try and let them use our conventional masks. We found that if you moved your head around too much, the nose/mouth cavity would flood, which could be cleared by tilting your head up, but it was too frightening for all the men. We also had a lot of problems with fogging, no matter what we tried in the mask. Usually we clean our masks with dish soap after each use, spit, and then tolerate a small amount of water in the mask. Then if it fogs you can just tilt your head around and rinse off the fog (although with our own good quality masks, fogging was rarely a problem). We ended up renting masks and snorkels for both. If anyone wants 2 full face masks, they will be on sale on eBay. The last poster's sons discovered that the full face mask is not designed for anyone with beard or stubble and all the guidance on the Tribord website advise that this is the case. The problems that the parents then experienced with those same masks suggest to me that the masks either did not fit or were not tightened enough. Still I understand that not everyone likes them but I still love mine and am looking forward to using it again in the Maldives next week. Both my son and I, novice snorkelers, tried our full face masks today in Sint Martin for the first time and had difficulty breathing - even after slowing down and taking a rest. We independently hit a wall about 5-6 minutes in, and had to return to the boat, completely out of breath. Another person in our group had a similar mask and had no problem. If anyone has had experience putting prescription lenses in one of these masks, I'd like to hear about your experience. I tried one of these masks in Bonaire on a snorkel trip, and thought it was GREAT compared to my traditional mask and snorkel. We just got back from Maui and I got an additional easybreath mask so my husband would have one also. It worked real well with his beard and didn't leak or fog but he has issues with seasickness and he got a little nauseated when he wore his. He didn't get sick on the boats though so I'm glad to hear it may not have been seasickness after all. Have they done any studies on the cause of nausea? It still worked real well for me except for getting a little tight if I didn't take a break. I still think overall they are really great for those with vision problems or insecurities in water. Just returned from a trip to Cuba where myself and my two adult daughters used these masks extensively. 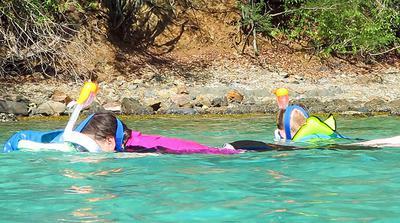 We all thought they were a great bit of kit and my daughters spent more time in the water enjoying the experience than they would have using a conventional mask; neither of them like the mouthpiece of the conventional mask. We all agreed that being able to breathe through our mouth and nose, the unobstructed mask view and the comfort of the straps really made the difference to the overall experience. The point about free diving is correct though, if you do want to submerge more than a couple of feet then maybe stick with a normal mask. But if you are content to float on the surface and take in the sea life from on top then the Easybreath is a great choice. Is the Ocean Reef Aria better? After reading tons of reviews from websites and Amazon, it's still not clear what mask is best. This website has mentioned the oxygen problem, and getting a hot face. Other sites have mentioned the snorkel tube falling off. So, does the new version of the Tribord Easybreath solve these problems? Also, is the Ocean Reef Aria snorkel design better for these problems? My husband & I love our Tribord masks. We've had them since 2015. It took me a little while to get used to it after years of a traditional mask & snorkel. My breathing technique & snorkeling swim approach needed to slow down. If I went too fast it felt like I was hyperventilating. So, this mask has taught me to slow down, take my time and observe everything in the coral & fish behavior. I love that.